Don’t just follow the flock! Does your business need help with your Social Media marketing planning, implementation or ongoing management and engagement? Are you overhwelmed by the options, or by the effort? 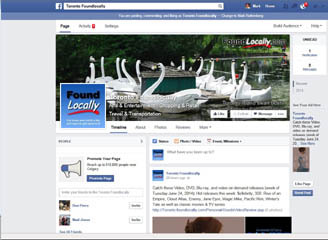 FoundLocally.com helps clients plan and implement Social Media campaigns and presences. This includes the obvious sites like Facebook, LinkedIn (including updating of professional resumes for key owners & executives), Twitter, Google+ (“Google Plus”), and MySpace (now-a-days, a specialty site for musicians and their fans). while many businesses focus on Facebook marketing, the other social media sites can be important for key audiences (like B2B). Then there are Social Media sites for sharing image like Pinterest (strong female demographic) and SnapChat, Instagram (youth demographic), and SnapChat (even younger demographic), which can help those who have visual products or can visually communicate their services. We design Social Media presences, and also help write and manage Social Media content & posts, shoot and/or select images for timeline (banner) usage and for specific posts. We can help you source stories, photos, and links to create interest in your Social Media presence. And we help you schedule updates and links to your website, so that your Social Media presences can improve the website ranking on major search engines. Look at all the different ways WE USE SOCIAL MEDIA ourselves, at the top-right! Each caters to–and draws traffic to us from– a slightly different audience. Some are better for business to business (B2B) , some are better for business-to-consumer (B2C), some are better locally while some are better internationally, and some are good for communicating to existing clients/subscribers, and others are better for expanding your audience beyond those not already clients. You typically only reach the people choosing to follow you… so its a hard way to grow a business form zero. 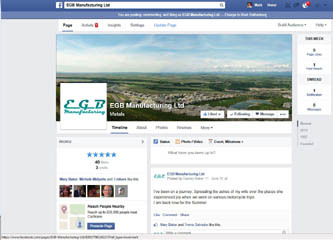 If you are an established business, its easier, by getting existing customers to “like” your Social media. Optimized Social Media Profiles: Keep up with new trends in search engines, SEO work, blogging topics, and encourage positive customer interactiond are all helpful to great social media marketing. Premium Content Creation: Good quality visual and written content is critical for marketing success and can include written content, audio files, e-books, written content, graphics, and videos. Blog posts: Develop powerful informative & motivating blog content can grow your online presence, develop strong communication, and build trust with customers. Social Shares: Sharing of new content, news, events, announcements, and business- or industry-specific updates on your website will encouraging users to visit regularly and reinforce your expertise. Paid Social Media Ads: An occasional boost from paid marketing and pay per click advertising can gain a timely advantage in a campaign. 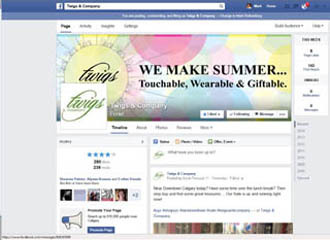 Social Contests: Well-designed contests provide a unique way to get the word out, create excitement, and encourage customer interaction. Usability Testing: Even the best plans will eventually (periodically) need to be adjusted and updated to address changing needs of the business, your customers, and also to optimize for the search engines. Comprehensive Reporting: Only by tracking every social interaction–including likes, shares, ad impressions, comments, vitality and total reach–can one understand which posts work to increase engagement. Consider the following questions when it comes to social media. Are your Social Media activities helping your SEO? Have you looked at your competitors, to see which social platforms they are using and how? How has your Social Media strategies and followers affected your brand? How would you respond to online feedback, whether it is positive or negative? Can you measure the customers who’ve found you through Social Media interactions? Do you know how to create content that will engage your audience? What photography do you use for Pinterest or Instagram? What video do you use on your YouTube channel? What plans do you have to grow your online communities? What value do you offer your customers through your social media accounts? How often do you update your customers via Social Media (and how often, on your website)? 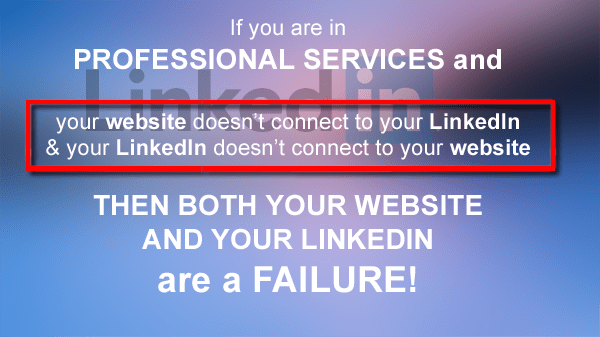 LinkedIn is the social network “for people with careers”. Originally it was just a resume posting website, but it has evolved into a magnet for corporate recruiters as well as others doing business in the “B2B” business-to-business space. It is target rich for finding the contacts and decision makers who will be buying your products or services, across a broad range of target industries. You need to create a personal LinkedIn profile, so people understand you are experienced, qualified, and connected. Then you can start building your personal connections, based on where you went to school where you work or have worked, and people you have met over the years (go through your business card files). If you are new to LinkedIn, a profile using your business e-mail may garner immediate connection request with people who have YOU in their email connections (and there for LinkedIn “wish list”) to speed this process. Then you need to create a business page, add corporate details, and like with Facebook’s Timeline, begin posting news announcements and relevant links. 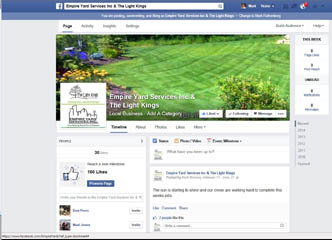 Facebook is great way to reach consumers where they typically spend their online time. 80% if Canadians use Facebook, and a good percentage of those visit every single day. 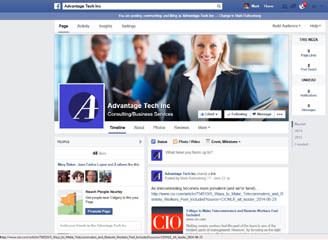 Businesses need to create a Facebook business page (and not a regular page, as if they were a “person”). 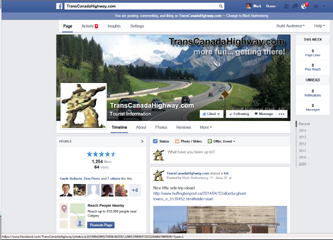 A business page provides all sorts of analytics about their audience demographics, and provides traffic measurement on their posts, so you can see which posts (or kinds of posts) are most popular, and which ones build traffic for your website. This reporting is not provided for personal pages. Also, with a business page, you should post key “milestones” in your business history to our Timeline. Unless you are a new business, your story may pre-date the creation of Facebook itself (in 2004), and your Timeline should reflect that. Facebook for business is smart for smaller start-ups, entrepreneurs, individual products or brands, as well as non-profit and charity groups. Of course the larger corporations are already there, using their brand and corporate popularity to reach a dedicated customer base. Keep in mind, even IF YOU ARE A B2B (business to business) business, your clients are made up of individuals, who probably spend more on Facebook (especially the above 25 age group) than on the other platforms combined. If your Facebook is looking for Friends and not for Followers, you have the WRONG FACEBOOK. Using a personal account for business use is not only a violation of terms of Service, but deprives you of any analytics (stats) about the amount of attention your posts and shares get form your followers, and demographic info about your followers. Facebook ads: With the decrease in organic Facebook marketing results declining, consider paid Facebook advertising to better reach your audience. Establish marketing plans to further youf campaign reach, promoted posts, improve offers acted-on, and re-marketing. Twitter ads: Use the Twitter advertising platform deliver highly-targeted promoted tweets and content in order to build awareness, boost brand recall, and build business. LinkedIn ads: LinkedIn Ad campaigns integrated with strategic use of sponsored updates can get the right message in front of the right customers. Integrated social media ad campaigns: We will incorporate your paid social media promotions with other PPC publicity initiatives in order to bring forth the high-performance, diverse campaign you need in order to achieve your marketing goals.